"TRUE Natural BodyBuilding" (short: TNBB), which basically means bodybuilding without EVER having used ANY performance enhancing drugs or supplements that do not occur in a normal healthy daily diet. I describe on this website everything about my personal training and diet, and I explain my vision on many aspects of bodybuilding such as training, exercises, equipment, nutrition, supplements, losing body fat, doping, and injuries. Please note that anything on this website is only my personal opinion, based on more than 25 years of experience as a true natural bodybuilder and my understanding as a scientist with a Ph.D. in biophysics/biochemistry. I don't claim that what I tell on this website is the only correct approach. It is not the intention of this website to thoroughly explain every aspect of bodybuilding or to become very scientific. If you want to know more about one specific subject, I recommend you to search the internet, which is full of detailed information. I also recommend you to use the free encyclopedia wikipedia.org as a general source of information. 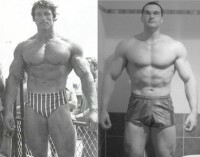 Some of the main goals of this website are to promote TRUE natural bodybuilding, to tell you how I have built my true natural physique, to explain some differences between true natural and drugged bodybuilding in terms of nutrition and training, to help you figure out what is really important to reach your bodybuilding goals, what is not important, and what is total nonsense. And believe me, there are lots of nonsense and irrelevant things being told and written in the world of bodybuilding. As you will notice while reading this website, I am a strong believer in the KISS (Keep It Simple, Stupid) principle. 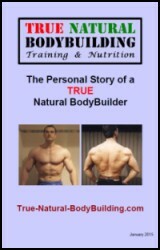 Building a great physique through true natural bodybuilding is much simpler than you might think. It does however require very strong dedication and persistence, and the art to figure out what is essential and what not. Watch the Youtube video below to get an overview of what this website has to offer you as a natural bodybuilder and to see some pictures of myself. You will see that this website is full of free information about natural bodybuilding, training routines, exercises, nutrition, supplements, gym equipment, injuries and much more. 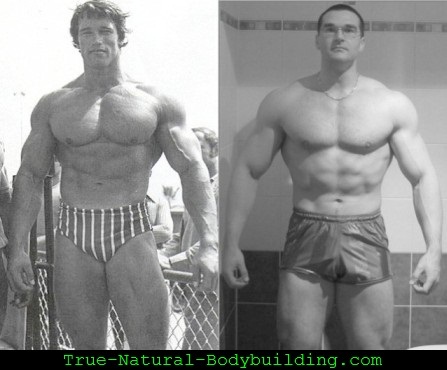 For your convenience I have concisely summarized all you need to know about true natural bodybuilding, including training, nutrition and supplementation, on a single webpage: how to get big - all secrets revealed. This webpage is a great starting point in case you want to read through the site and discover step by step everything you need to know in order to be able to develop your physique as efficiently as possible without using anabolic steroids or unnatural performance enhancing supplements. If you are serious about gaining muscle mass and especially about losing body fat you carefully have to monitor what and how much you eat every day. I have developed a very convenient tool for natural bodybuilders that can help you build your personal diet plan. It is an excel workbook that calculates how many calories, carbs, protein, fat, vitamins and minerals you need to eat every day. The excel sheet contains nutritional data for about 8000 different foods. You can watch the youtube demo video below or download the high quality video in Windows Media Video (.wmv) or Flash (.swf) format. Download the TNBB diet plan excel now for free. I have written down the complete true natural bodybuilding training routine that I have been following for years to develop my physique in a convenient excel format. It clearly outlines how the 5-day split training routine is built up, which muscles are trained in each of the 5 workouts, which exercises are performed for each muscle group, and how many sets and reps are done. Download the TNBB training routine now for free. Finally it is so far! The eBook version of this website is ready and available. All information and pictures available in an easy to read and navigate PDF-file with electronic bookmarks and hyperlinks. Now you can easily read everything you need to know about true natural bodybuilding from A to Z in one fluent text on screen or on a paper printout (170 pages letter/A4 format). Get it for FREE. Because there is one thing that is more valuable than being strong and muscular, and that is being alive and healthy. Not only when you are 20 or 30 years old, but also when you are 50 and above. And believe me, the candle of life burns fast, very fast. TNBB is a statement against the chemicalization of our sport, against the brainwashing of our youngsters by the fitness industry to believe that without supplements you limit your muscular development, and against bodybuilding competitions where harmful drug abuse is rewarded and encouraged. And yes, it is a scientific fact that steroids damage your sexual and cardiovascular health with often life-shortening consequences, as explained in this video. 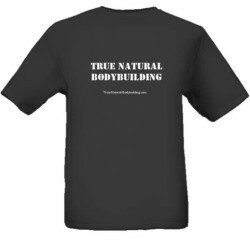 Promote the sport that you love so much and show the world that you are 100% natural by wearing your own True Natural BodyBuilding T-shirt. Get it now!